Since August 2011, 100 neonatal intensive care units in nine States have participated in a national, neonatal central line-associated bloodstream infection (NCLABSI) reduction project as part of the Agency for Healthcare Research and Quality-funded national effort to prevent central line-associated bloodstream infections in U.S. hospitals by implementing a Comprehensive Unit-based Safety Program (CUSP). CLABSI is a significant contributor to morbidity and mortality for infants in NICUs because of these patients have immature immune systems. 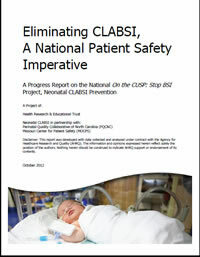 This Progress Report on the National On the CUSP: Stop BSI Project, Neonatal CLABSI Prevention provides an overview of the project's accomplishments to date and discusses the project's next steps. Disclaimer: This report was developed with data collected and analyzed under contract with the Agency for Healthcare Research and Quality (AHRQ). The information and opinions expressed herein reflect solely the position of the authors. Nothing herein should be construed to indicate AHRQ support or endorsement of its contents.